It is no wonder that the dove is the universal symbol of love and peace. They have the most tranquil and gentle spirit. Their cooing vocalizations are pleasantly laid back and mellow. There is simply nothing about this bird not to love. 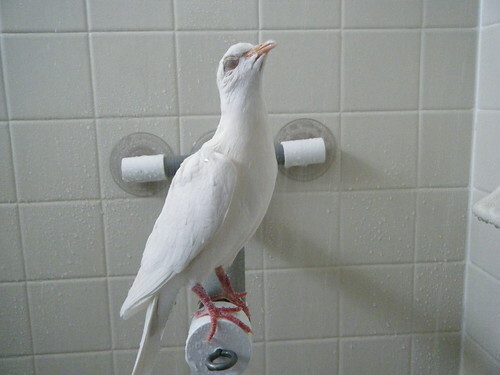 The Womachs have left their dove in my care while they are away. Ari, so named by the fans on the Birdtricks facebook page, is the easiest bird I have ever cared for – it almost seems too easy. To be sure that I give Ari the best possible care, I have been reading about them online and contacting dove owners about their needs. 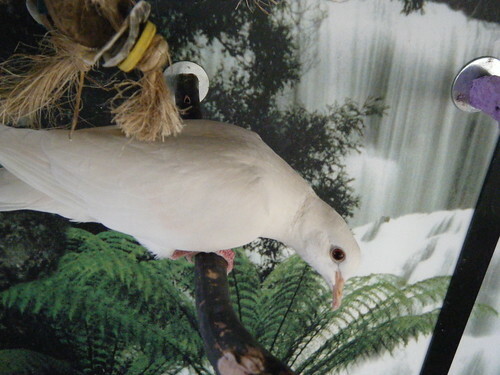 Ari is a white mutation of the ringneck dove species which belong to the Columbiformes family. (The now extinct dodo bird is a former member of this family.) Many things about the dove seems in contrast to the parrot – they dont scream, they don’t bite. Doves have a sweet disposition and are almost naturally tame. They are smart, hardy, sociable and undemanding. My only struggle is in trying to feed Ari properly. There is precious little information out there regarding the dove diet because there has been so little research done on the subject. I am still on the lookout for information regarding their exact dietary requirements so I can create just the right diet for this bird. Even in the world of dove enthusiasts, there is debate and uncertainty. As we have learned in the parrot world, just because a bird has “survived” on a certain diet, it doesn’t make it an acceptible one. We now know, through trial and error, what the differeing basic dietary requirements are for several parrot species. They are not all the same. I don’t expect to find that the dove has the same requirements as a parrot. I do know that the current recommended diet is failing the dove. When you look up their life expectancy it says they can live to 25 years of age, but generally only live for 10-15 years. What does that tell you? When you research their diet online, the common word is seed. Actually, the ONLY word is seed. Just about everywhere says that their diet consists of a seed mix for canaries and finches, or a blend for wild birds. Seed, seed, seed. Oh, and water. It sounds very much like the presumed diet for parrots not so very long ago. Anyone who knows me knows that this is unacceptible to my way of thinking. It is inconceivable that any bird exist, let alone thrive, on a single type of food, never mind one so one-dimensional. I had to hunt far and wide to find the people who were feeding the diet that made sense to me. As I suspected, well, insisted, fresh foods ARE part of the dove diet. The question remains, though, how much of which foods? Purina has a pellet formulated for doves, but I wonder where THEIR nutritional info came from? For now, Ari receives a fresh food diet similar to that which the parrots are eating. I found a seed mix that is made for doves which will do until I find something I prefer. I have not yet ordered the pellets because of debate on the subject of their quality and worth in the diet. And I include a blend of grit types that also provides some mineral supplementation. As I discover new things, I will pass on any worthwhile information I encounter about these wonderful birds. They are a bit of a mystery. Ari is an active bird who uses every square inch of his cage. He plays with toys and shows great interest in the other birds in the room. He obviously enjoys his showers. I think I’m in love. Doves might be the perfect choice for someone wanting a bird who doesn’t want some of the typical parrot attributes like unpredictability and noisiness. 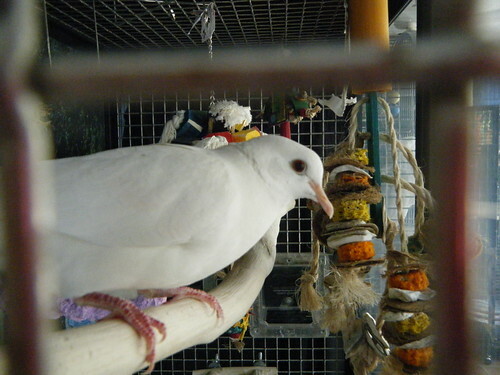 Doves are cuddly and soft and social. They are nearly perfect as avian companions…so much so that I am suspicious. Being a parrot owner, I keep waiting for the “true” nature of this bird to assert itself, but I am assured by dove owners that this is it. Having cockatoos, I guess I have different expectations about the behavior of white birds!